Like all proteins, the DNA polymerases are encoded in genes. The genes that encode the human DNA polymerases are contained in the genomic DNA at various positions on several different chromosomes. In February 2001 the first "working draft" sequence of the human genome was published. Analysis of this sequence shows us that there are perhaps as many as fifteen different DNA polymerase genes in the human genome. Each of these genes encodes a different DNA polymerase protein. However, biochemists have not yet isolated all of these enzymes. A similar analysis of the Escherichia coli genome shows us that there are five different DNA polymerase genes present in this bacterium. The multitude of DNA polymerases in human and bacterial cells indicates a specialized role for the different enzymes in various aspects of DNA replication and repair, many of which have yet to be identified. (polymerase epsilon 1) genes, which are located on chromosomes 19 and 12, respectively. These three DNA polymerases are most frequently associated with replication of the human genome. The DNA polymerase 3 is encoded by the POLB (polymerase beta) gene on chromosome 8 and is involved in DNA repair. The DNA polymerase y is encoded by the POLG (polymerase gamma) mitochondria energy- gene on chromosome 15 and replicates the DNA of the mitochondria. In producing cdl organelle Escherichia coli the DNA polymerase I is the most active. This enzyme functions in the bacterial cell to repair DNA, while the DNA polymerase III is responsible for replicating the genome. There are several additional DNA polymerases in human and in bacterial cells of which the precise function is not known. Some of these enzymes might be necessary to replicate genomic DNA that has been damaged. The ability to replicate damaged DNA could lead to mutations introduced into the genome but would preserve the life of the cell. The amino acid sequences of the DNA polymerase proteins can be deduced from the genetic code contained in the DNA polymerase genes. Based on the amino acid sequences of the DNA polymerases, these proteins have been classified into several families. Analysis of these sequences reveals a relatively diverse collection of proteins with some very important similarities in specific amino acid regions along the length of the protein. The similarities in amino acid sequences in certain parts of the DNA polymerase proteins tell us that these regions of the protein have been conserved throughout evolution. These specific amino acids are those that are catalytic describes a important in the catalytic function of DNA polymerization by these proteins. Some of the similar amino acids are necessary for binding metal atoms that are needed by the DNA polymerase to carry out the polymerization reaction. Other amino acid sequences allow the DNA polymerase to hold on to the DNA and the four different deoxynucleoside triphosphates as the enzyme polymerizes the new DNA chain. Some DNA polymerases have the necessary amino acid sequences to generate a 3' proofreading exonuclease domain (region), allowing the DNA polymerase to remove mistakes, or proofread, as it builds the DNA polymer. The DNA polymerases range in size from just over three hundred amino acids in length to more than two thousand amino acids in length. Three-dimensional studies of these enzymes have shown that the DNA polymerases have a common protein fold that resembles the shape of a "right hand" (see diagram). 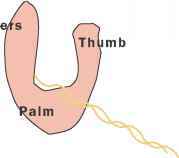 The "thumb," "fingers," and "palm" form a pocket along which the DNA can move. The DNA molecule interacts with specific amino acids located in the "palm" region of the DNA polymerase, and the "thumb" clamps down on the DNA to hold it as the DNA chain-elongation reaction proceeds. The amino acids that are common in many of the DNA polymerases are found in the regions where the enzyme contacts the DNA molecule. see also DNA Repair; Escherichia coli (E. Coli bacterium); Human Genome Project; Nucleases; Nucleotide; Mutation; Replication; X Chromosome. Baltimore, D. "Our Genome Unveiled." Nature 409 (Feb. 15, 2001): 814-816. Blattner, F. R., et al. "The Complete Genome Sequence of Escherichia coli K-12." Science 277 (1997): 1453-1462. Venter, J. C., et al. "The Sequence of the Human Genome." Science 291 (2001): 1304-1351. Wood, R. D., M. Mitchell, J. Sgouros, and T. Lindahl. "Human DNA Repair Genes." Science 291 (2001): 1284-1289.